At MobilBid, we like sharing information about our products, practices, upgrades and generally what we are all about. We also like hearing from you. So if you have information to share, questions to ask or stories to tell, please let us know. Non-profits and event organizers are using MobilBid to hold silent auctions that are easy to manage, exciting for their guests and quite simply raise more money - with a lot less fuss. They share their tips with us and we're happy to share them with you. MobilBid was designed as a full-featured, highly effective mobile bidding platform that clients are using to improve the results of any-sized fundraiser. So forget those stories about the high-cost of mobile bidding and discover MobilBid. We'll help you reduce costs and raise more money. 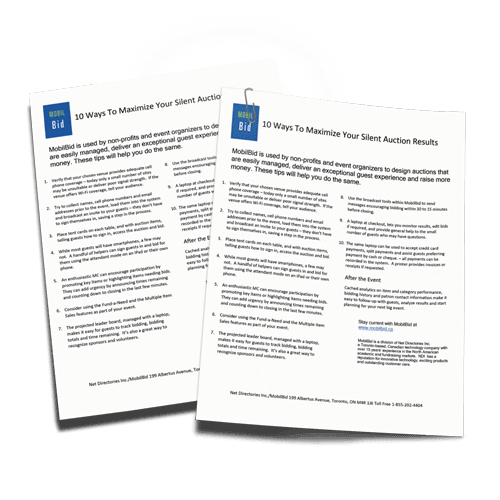 Technology has revolutionized the world of silent auctions and right now is a great time for an update. 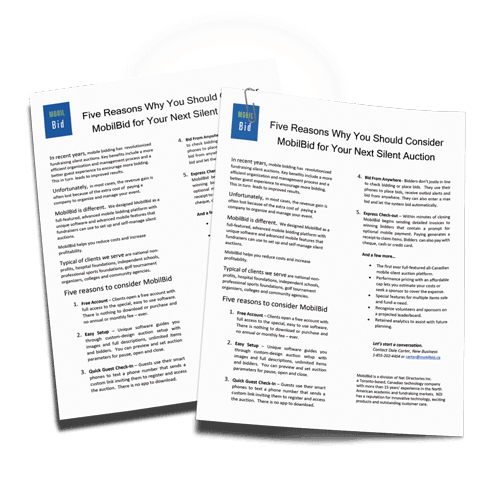 We prepared this article - originally published in the Hilborn* Charity eNews - that tracks the change technology has brought to tried-and-true silent auctions and what you can expect from MobilBid. Hilborn has been updating non-profit leaders on news, trends, tips and analysis of developments in the fields of fundraising and non-profit management since 1991. Find them at www.charityinfo.ca. Still Using Pencils and Bid Sheets But Not Looking Forward to Your Next Silent Auction? A couple of minutes watching this short video will give you the lowdown on how MobilBid can help you set up and manage your next event - deliver an amazing guest experience - close and clear your venue in minutes not hours and most importantly spend less to raise more money. Recently, two young curators chose MobilBid for a unique Toronto art exhibit exploring makeup as communicating cultural and social identity. This fundraising exhibition featured 24 portraits by renowned photographer Leeor Wild. Working with the curators, MobilBid helped design and set parameters of the charity silent auction for this fundraising event. Visitors simply texted a special number to instantly access the auction, with portraits and descriptions, to start bidding. This brief video delivers a fascinating glimpse of this exceptional event. Unity for Autism is a Toronto – totally volunteer-based - charitable foundation dedicated to assisting the many service providers for autism overwhelmed by the growing number of families needing their services. The annual Unity Golf Classic is the organization’s signature event and has raised hundreds of thousands of dollars since its inception. This year Copper Creek Golf Club in Kleinberg, just north of Toronto, hosted the fundraiser. MobilBid worked with organizers to design and set up the charity silent auction for this fundraising event who then managed the auction from a laptop computer. Delegates to the AFP Congress in Toronto were invited to participate in a MobilBid "Mock Auction" to try the product and bid on unique business items.